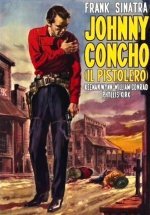 Although an inexpensive western must have seemed a safe bet, it's strange that Frank Sinatra should have chosen this particular story for his producing debut. Strange because he's ideally cast as an obnoxious coward protected by his notorious gunslinger brother. After the brother is bumped off and his killers take over the town, It's predictable Frank should eventually summon up the courage to face them. Curiously, though, he never shakes off his odious earlier image. Sinatra's pal, former actor Don McGuire, co-wrote the script and made his directing debut with this very watchable drama.